much love, illy: sponsor love: Asian iCandy $25 shop credit giveaway!!! sponsor love: Asian iCandy $25 shop credit giveaway!!! i am a little giddy over this giveaway because i am absolutely in loooooove with my lady of roses chiffon dress from Asian i-Candy. the quality of the dress is excellent and a perfect fit - the sleeves and material so whimsical and fun! i have a feeling that you too will fall hard for them. as noted on their incredible site, Asian iCandy Store features Asian-inspired clothing, accessories and deco directly from independent artists/designers. 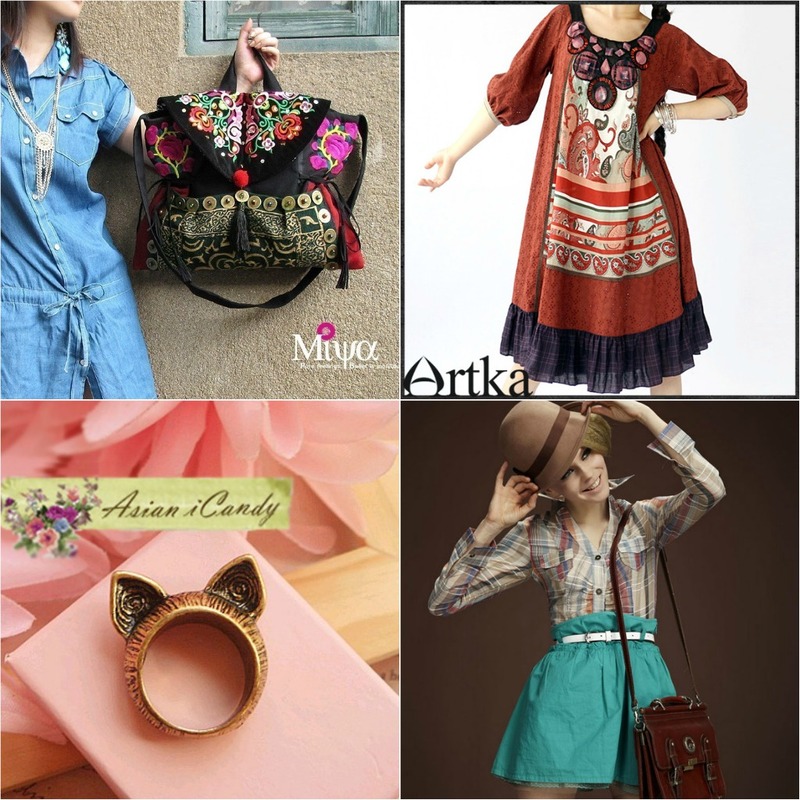 Not only we carry trendy Japanese/ Korean fashion items, but also we specialize in mixing traditional Chinese, Tibetan, Mongolian, Vietnamese or Thai elements with modern sensibility. holla! be sure to enter like an insanely-obsessed person so that you don't miss out on the chance, folks! use coupon code ILLY at Asian i-Candy checkout for 15% off of your entire order! Giveaway is open to ALL Much Love, illy readers thru August 29th. Oh my i love the being with you chiffon top. Please please, i want to win! I like Asianicandy on facebook! --- I'd love to win this Miao Silver Elephant Tassel Necklace because it's super cute & so unique! --- I liked Asian i-Candy on FB under: Nicole O.
Oh!I love too much. Maybe the Labyrinth shoulder bag?!?! I would buy the Crochet Me Over Vest! & I liked them on facebook! OMG Ilene did you see the camera tote bag?! I bet you're not surprised I picked that lol, I hope I win, its amazing! I might just have to go and buy these even if I don't win the giveaway, but I love the Free and Easy flats, Cold Moon Embroidered Shoulder Bag, Colorful Dream On My Way Backpack, and Spring Flowers Wrap Me Dress. Thanks for turning me on to this site! I absolutely love the Hello Kitty iPad case ... I love all things Hello Kitty. I like them on Facebook. I love the Red Monroe Dress! you look so cute in that dress!! I love the butterfly bowtie print shirt dress! What an adorable collar! I follow @asianicandy on twitter! I love you on twitter! I would get a top - maybe the lace top? I adore all their garments but am totally in love with the pleated chiffon dress!! If I won I'd put it towards the chocolate buckle satchel. I'm in love with the Bright Dreams Pleated Chiffon Maxi skirt! That color is amazing! I'm drooling over the Zebra Doodle Top, the design is really trendy and so unique. I would get one of their T's or the flying swallows top! I follow asian candy on twitter! This stuff is so beautiful! I would love to get like... everything ;) But I'd definitely start with the supercute "like a kitty ring". It has been my musthave for like a few years now, but it's so hard to get them here in Poland without paying a ridiculously high price. great giveaway!! i love the floral lace lady coat. and i follow them on FB! There are so many great pieces to choose from. But for me it would be a toss up between the Bright Dreams pleated chiffon maxi skirt and the vintage style briefcase. I liked Asian Icandy on facebook.